MelT wrote: On a side note, Tapas Barcelona is owned by a former Chicagoan. Tapas Barcelona got a few good mentions from some people who were staying at our hotel (they went two or three times while they were in town). We never made it there, along with many, many places that have yet to be checked out. You're absolutely right about Barcelona Tapas. It's a great restaurant and the chef (Bill) used to work at Emilio's in Naperville. Great guy, very friendly. There is also a place in town that is a beautiful, boutique hotel and serves dinner that I just remembered. Best view of town and quite a nice experience. Cocktails and appetizers on the lower level with live music followed by dinner upstairs. I will email friends and get the name. I also spend the month of February in PV. 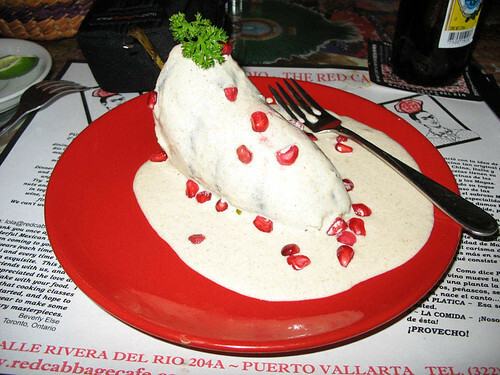 Anyone know of any new and interesting restaurants in Puerto Vallarta? I'll be heading down there this weekend. We've been down there for the past 10 years, so we know all the standbys (Tino's, Xitomates, La Palapa, Cafe des Artistes) ... in fact, the chef/owner of Cafe is now a family friend and his #2 lived for a month with my parents while spending a month at Carlos'. But what's new within the past year or so? Since you know him that well, the chef/owner of the Cafe is the guy to ask. He'll know better than anyone here. Then check them out and report back please. Consider it a mission. Jazzfood wrote: Since you know him that well, the chef/owner of the Cafe is the guy to ask. He'll know better than anyone here. Then check them out and report back please. Consider it a mission. Yeah, we always ask Thierry for recs when we see him but it depends on how far into the vacation until we head into Cafe des Artistes. Hugo, the sous chef, was supposed to take us around to the good/safe street stands a couple years ago but got promoted from meat chef just before the holiday peak and didn't have time. blipsman wrote: Yeah, we always ask Thierry for recs when we see him but it depends on how far into the vacation until we head into Cafe des Artistes. That guy, Thierry Blount, seems to be the top gun chef in PV. He is largely responsible for the Festival de Gourmets that I posted about upthread. He has something like a Lettuce Entertain You empire with several restaurants under his banner, a couple of them new in the last year. Cafe des Artists is the fanciest restaurant in town, but because of Thierry's chain-like ubiquity in PV, I have shied away from going to any of his restaurants. I'm sure several (or maybe even all) of them are good, but I was somewhat turned off by his corporate "theme park" approach and wanted to check out places that were more in the Mom & Pop school; or at least operations that are more individualized. It is a beautiful restaurant though and you can always just go listen to music and have a drink. If you haven't been to Cafe des Artistes in a couple years, they've reconcepted it a bit. The actual "Cafe des Artistes" is now called a bistrot and not that expensive for the level of fine dining (most entrees $20-30, 3-course + wine fixed price menu under $40), still excellent as it ever was and the garden is spectacular. They have also added the Thierry Blouet Autor room, which is truly world class dining on par with the best Chicago has to offer short of maybe Alinea or Trotter's. It runs $55 for 3 courses to $125 with 5 courses w/ wine pairings. Cafe des Artistes is definitely on my list of places to visit again this year. I just hope I don't have to argue with the hostess about my reservation again. We've eaten at Hacienda San Angel each of the past two years. Amazing setting and very good food. Cooking class at Red Cabbage - choose any 2-3 menu items. We learned how to make chile en nogada and tortilla soup. And I can't believe I forgot to mention in earlier posts, but the rotisserie chickens outside the Gigante grocery store (the stand to the right -- there's on on either side of the entrance) a little north of downtown are the best chickens anywhere! A chicken, some of the little potatoes that sit under the chickens and soak up the drippings, some fresh tortillas and a baggie of red sauce runs about $6. Buy some fresh salsa and an avocado in Gigante for a feast for 3-4 people for about $8. blipsman wrote: Cooking class at Red Cabbage - choose any 2-3 menu items. 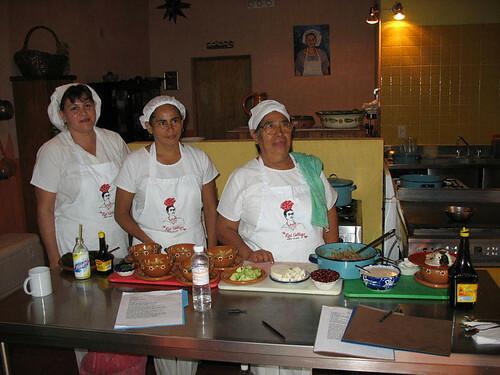 We learned how to make chile en nogada and tortilla soup. Red Cabbage sounds intriguing. I checked around online, and no one mentioned cooking classes, but I may look into that. The Wife and I went to El Arrayan last weekend, and tried the crickets. Although the service at El Arrayan is the late and winning entrant in the Worst Service of 2007 category, the crickets were some of the best bugs we ate in the past year. They were roasted with a little chili and garlic, maybe a touch of scallion, for good flavor and characteristic arthropod crunch. Aside from the slipshod, careless service (over an hour lapse between apps and entrees, with constant assurances that we would be “next), I was appalled by the soulless, tasteless, maybe-not-even-corn-based corporate mini-tostadas served here (this despite the article posted on the wall, apparently by Carmen Porras, extolling Slow Food virtues). Our tortillas seemed made-in-house, but as we waited for dinner, a server whisked them away; when I tried to stop him, he explained he was French and spoke little Spanish or English, and before I could summon college level Francais, we were left tortilla-less. The chile en nogada was pretty good (though $20 seems a touch high for just one), but I found the dish somewhat lacking in dimension – it was quite sweet; a little heat and salt would have helped a lot, and the stevez-endorsed salsa negra was helpful, though it somewhat overpowered this confection. We had ordered the plantain empanadas, but when our order eventually came up, they were out of them. The salad of goat cheese and nuts was flat and uninspired. Our shrimp pozole was despicable – actually inedible, as though the broth were made of the warmed liquid you get in a can of Progresso hominy. 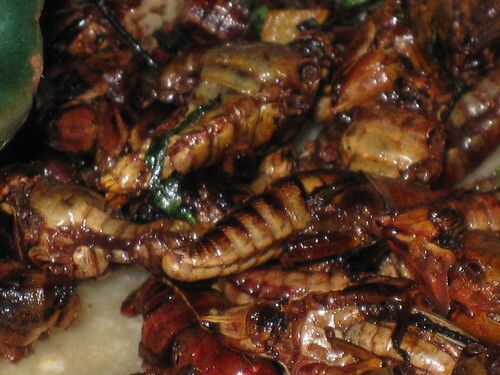 Getting back to bugs, I was speaking with a cabbie about the edible insects of Mexico, and he mentioned several varieties that are available around Mexico City and that he enjoyed quite a bit. I mentioned the media attention we received last spring/summer for our cicada adventures, and he looked at me like, “What’s the big deal?” When I explained that in our part of the world, bugs are generally not considered edible, his expression changed from uncomprehending to bemused. Stevez, thanks to your pictures and your amazingly detailed posts, I have convinced my friends that we should go to PV instead of Isla Mujeres off of Cancun. Just booked our tickets! The beach near our hotel was fabuloso. Playa Los Muertos, which is near the Romantic District is also very nice and picturesque with little fishing boats anchored off shore, but the very best of the beaches are reachable via water taxi only. Yelapa and Mismaloya are two that come to mind. There is a great site called Virtual Vallarta that has lots of info on beaches and other activities in and around the area. P.S. Having been to both Puerto Vallarta and Isla de Mujeres, I'd say you made the right choice. IdM is very nice, but is hardly worth more than a day trip from Cancun or Cozumel. Donna and I will be back in P.V. on the 29th of January. We're very miuch looking forward not only to going back to Tino's, but also to trying some new places. 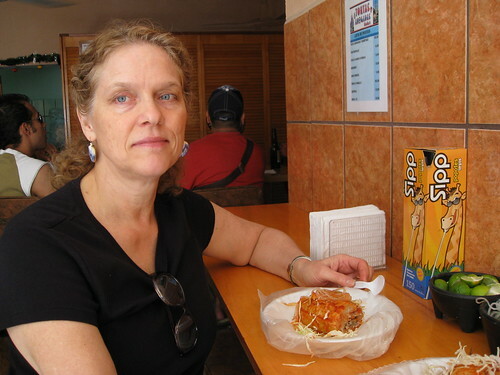 We came by early one night and ordered several items; the sope, tamales, and tostadas were good enough, but as you might expect, the pozole was the fav. I went with a large “surtido” (translation: filled with different meats). The broth was simply fine, the pork and beef spoon-tender, full-flavored hominy kernels, nothing fancy, just a grand bowl of elemental deliciousness for about four bucks. 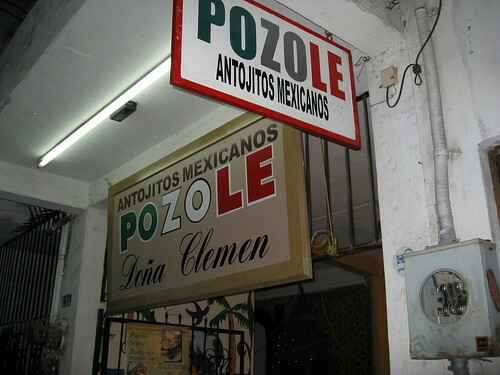 We ate at many places in PV, and I liked lots of them, but Doña Clemen is a friendly and humble place, immensely satisfying, kind of my little three happiness in Jalisco. Back from my two weeks in PV. The only "new" restaurant we went to was a fajitas place requested by others in the group and that could accommodate our entire group of approx 15. - New Years Eve - had maids cook Mexican feast of chile relleno, chicken in red sauce, garlic mahi mahi, enchiladas, rice, beans, homemade guac and pico by the gallon, etc. Trio stood out as the best restaurant this year. In fact after my fiancee and I went for "date night" and reported back, my parents wanted to go so we went twice. Ulf and Bernhard sure know what to do with veal -- the veal ravioli and the veal loin entree were the best dishes. Had breakfast with Ulf when my parents hosted a "Sister Cities" brunch at our condo for members of the PV and Highland Park Sister Cities committees. Had some interesting discussions about how they work together and run both Vitea and Trio -- they literally alternate every night between the two kitchens. Cafe des Artistes was solid, as usual. Thierry Blouet broke his arm recently and is opening another Cafe des Artistes near Punta da Mita next week, so he wasn't around this year. Did see Hugo, who is now the main chef in the Autor room. Were supposed to have lunch with him and his fiancee, but never could coordinate it. Two which I would scratch off the list for future visits -- Gazebo and Xitomates. Both have gone down hill since previous visits in terms of food quality, and Xitomates service was downright horrific. Last edited by blipsman on January 8th, 2008, 8:18 pm, edited 1 time in total. My parents have their time share at Los Tules as well! We have been going there for years! 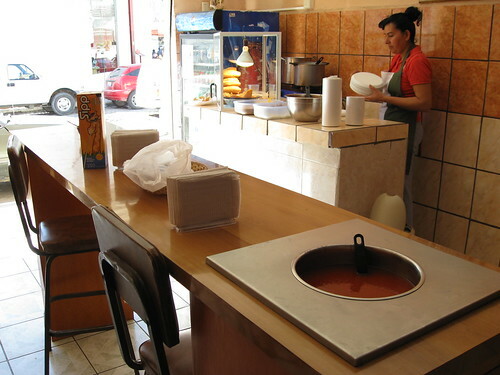 We love Cafe Chapultapec for our breakfasts and lunches. I do not know how long you have been going there, but the man who used to run the cafe (Aduato) opened up his own place in Busarias called Aduato's Beach Club. He took with all the old guys. It was a 40 min cab ride from Los Tules, but well worth it. The food was great. His restaurant is located on a beautiful beach. He has tables set up and they will serve you on the beach as well. We ended up spending most of the day there. Cafe Chapultapec is sure different without all the same guys. Most had been there the entire time we'd been going... then Manuel was gone last year, and this year only one waiter from last year remained. It definitely is not the same without all the "old guys". Still, there is nothing like having breakfast and looking out over the wall at the beach! Love it there!!!! Oh, and of course there is always the Muffin Man! Woo Hoo. 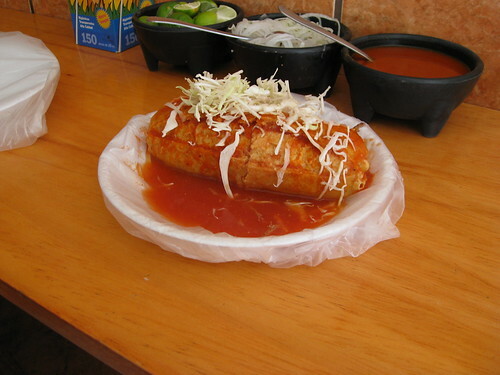 Earlier this month, being in Jalisco, I felt the need for torta ahogada, a sammie specific to the capital of Guadalajara, but popular throughout the state. I found a little place near our hotel that opened somewhat early (like around 10:00 AM, perhaps for breakfast; it closes at five). 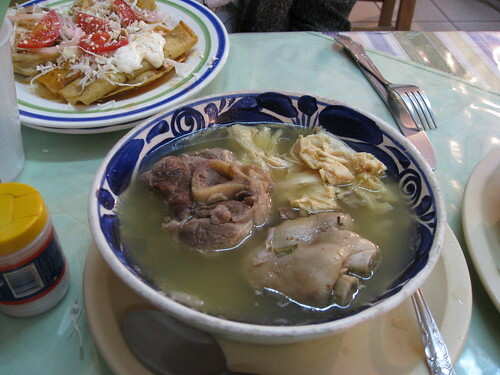 The meat is carnitas and the bread is a thin torpedo shape, somewhat smaller and thinner than a standard bolillo. That’s shredded cabbage on top. Condiments include lime, hot sauce and, most intriguingly, vinegared onions with oregano. I had all three. Notice that this “drowned sandwich” is to be distinguished form the pombasos served at Maxwell Street Market, which are the same concept, but as the august Vital Information has noted, they differ slightly in that the latter are cooked in a pan with the sauce. I'm sure I'll find this place once I get to PV but can you tell me which hotel you stayed at so that I have a more general idea of where to start looking? I have friends that are already there for the winter and they tell me that there is a new bakery (just breads) in town. 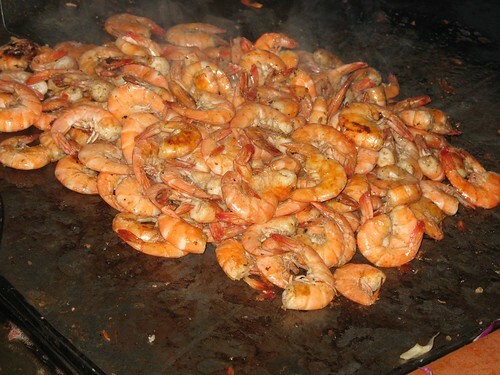 She says that it is really spectacular and he's supplying to some of the higher end restaurants. The owner has offered to let us come in and help with the baking. I understand that they built their own oven...something I keep threatening to have done in my backyard but my husband thinks that's crazy. Probably is but I like to torment him with threats to build it anyway. Our hotel was right near the Senor Frogs. I believe that this torta place may be one of several in PV and Jalisco -- the signage has a certain "branded" feel. 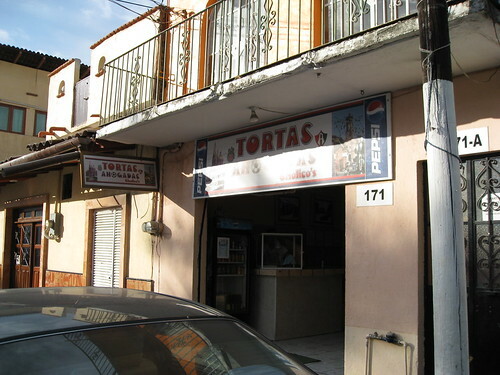 Still, it's a humble walk-in joint, frequented by locals; pretty much all they sell are tortas ahogadas. Great! I'll give it a try. We're booked - March 21 to March 26. Give me a PM holler if you're going to be in PV and up for a shared table some night. Has anyone been there during / over Easter Week before? I'd be interested to know which towns, parishes, or churches have processions, vigils, services with good music, or town square markets as I've seen other places (Taxco) in Mexico on Easter. Also: in the central hotel zone, has anyone had experience with food in the area immediately around (and including) the Fiesta Americana? We haven't confirmed there yet but that seems fairly central. Unfortunately, I'll miss you. I'm there for the month of February. I used to stay at the Fiesta Americana and it's a very nice hotel with one of the better beaches. I'll let you know which restaurants I go to while I'm down there. Things change rapidly in PV. I understand that the marina has a couple of new restaurants and that's close to where you'll be staying. I'm here in PV for a week now and there are two places I'd like to report on. First, on the beach, next to El Dorado is a very small restaurant that you'll just walk right by if you're not really looking. It's the Beach Club. The staff are from the Four Seasons in Punta Mita. They're only open until about 5:00 (maybe 6:00 pm) GREAT sandwiches and salads. More pricey than others but well worth it. Really quality ingredients. Second, the best bread shop I've found either in PV or at home. The Artisan Bakery on Calle Morelos 875. It's one block off of the Malecon across from the Lans that is closer to town. We made friends with the baker who is Mexican but lived in California. Trained in the states, won many awards. We baked with him one morning and going back on Saturday. He built his own brick oven (something I'm trying to talk my husband into). This guy is truly an artist. Must see. Don't forget to go to LaPalapa on a Monday or Tuesday for a romantic evening of music with Alberto. You can sit on the beach with a glass of wine. Doesn't get much better than that. Jean Blanchard wrote: Second, the best bread shop I've found either in PV or at home. The Artisan Bakery on Calle Morelos 875. It's one block off of the Malecon across from the Lans that is closer to town. I'm sorry I missed that bakery. I saw someone walking down the street with a fresh baugette one day and I couldn't figure out where she got it. Now I know. Yesterday, I learned how to make a perfect loaf of rye bread from the Artisan Baker. After working with him for a couple of hours, we made a pizza. His first in his new oven. Fantastic! I am SO building a brick oven in my backyard. Dinner last night at Agave Grill. I hope more people discover this place because it was really well prepared, innovative food. I had a pork shank with mole, others had the seafood and chicken enchiladas in a creamy sauce. Not your ordinary enchilada. Zucchini blossom soup and salad were beautiful and very tasty. Cool, Jean! Thanks for the engaging reports. You're certainly not missing much weatherwise here.